Deutsch: Die Flagge des Kurfürstentums Sachsen bis 1806. 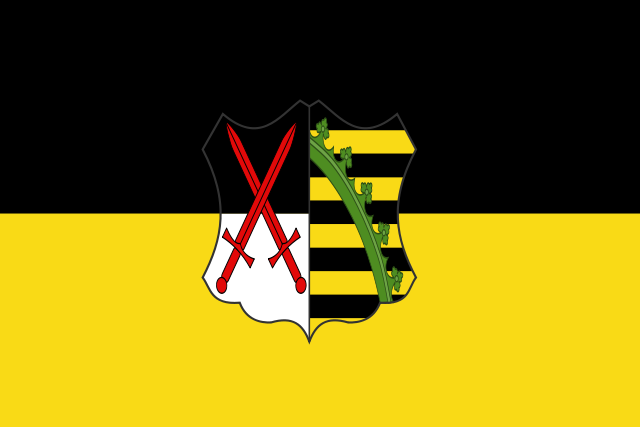 English: Flag of the Electorate of Saxony. Nederlands: Vlag van het Keurvorstendom Saksen. Autor Sir Iain, crancelin by User:Sodacan from File:Arms of Albert of Saxe-Coburg and Gotha.svg. současná 30. 1. 2011, 18:41 600 × 400 (30 KB) Kaiser Torikka Made some fixes to the shield, made the yellow a complete background to look better when sized down.